Antholyza fourcadei L.Bolus, Homoglossum fourcadei (L.Bolus) N.E.Br. EOO 3109 km², plants at four remaining locations continue to decline due to ongoing habitat loss and degradation. Uniondale to George and Knysna. Fynbos, heavy soils either clay or loam at the sandstone-shale transition, often near streams. 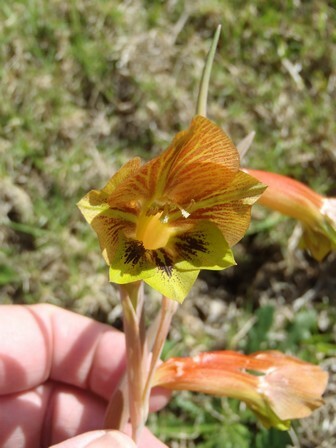 Gladiolus fourcadei has declined extensively due to habitat loss to agricultural expansion in the Langkloof, as well as overgrazing and degradation of remaining fynbos fragments on lower slopes. On the southern side of the Outeniqua Mountains, it has lost nearly all of its habitat to timber plantations, crop fields and urban expansion. It continues to decline due to ongoing habitat loss to urban expansion, competition from alien invasive plants, inappropriate fire management and overgrazing. This species is known from a large number of historical records from the Langkloof between Uniondale and Knysna, where field surveys indicated that it had become locally extinct due to habitat loss and degradation. It was known from a single surviving subpopulation in the Kammanassie Mountain, where field surveys recently recorded a few more localized colonies along high altitude shale bands. 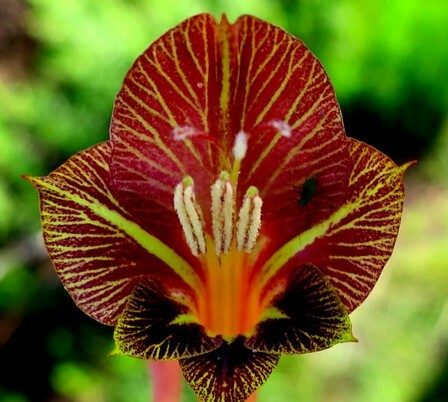 It has also been recently found along the southern foothills of the Outeniqua Mountains between George and Knysna, where it has lost extensive habitat, and all known subpopulations occur in small fynbos remnants. The largest subpopulation consists of about 200 mature individuals occurring in a site earmarked for development.